This article is about the Dutch city. For the cruise ship, see MS Zaandam. Zaandam (Dutch pronunciation: [zaːnˈdɑm] ( listen)) is a city in the province of North Holland, Netherlands. It is the main city of the municipality of Zaanstad, and received city rights in 1811. It is located on the river Zaan, just north of Amsterdam. The statistical district Zaandam, which covers the city and the surrounding countryside, has a population of around 76,804. 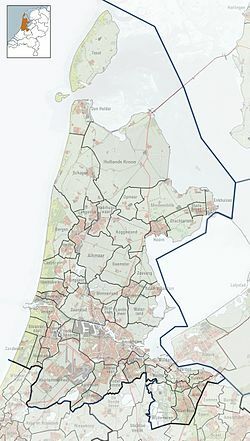 Zaandam was a separate municipality until 1974, when it became a part of the new municipality of Zaanstad. The history of Zaandam (formerly called Saenredam) and the surrounding Zaan River region (the Zaanstreek) is intimately tied to industry. In the Dutch Golden Age, Zaandam served as a large milling centre. Thousands of windmills powered saws that processed Scandinavian wood for the shipbuilding and paper industries. A statue that commemorates this industry was commissioned from sculptor Slavomir Miletić, and the statue, De houtwerker ("The Woodworker"), was installed on 20 June 2004. Zaandam was a leading city in the first Industrial Revolution. Into the second half of the 20th century, Zaandam was still an important lumber port. Zaandam is also historically linked with the whaling industry. In 1697, Czar Peter I of Russia spent some time in Zaandam, where he studied shipbuilding. He stayed in a little wooden house from 1632, but was soon forced to leave because he attracted too much attention from the local population; he moved to Amsterdam, where he studied at one of the wharves of the Dutch East India Company. The wooden house he stayed was preserved and turned into a museum, the Czar Peter House. A statue honoring him was placed on the nearby Dam Square in 1911, and was declared a Rijksmonument. In 1871, the impressionist painter Claude Monet lived in Zaandam for approximately half a year. During that time, he made 25 paintings of the area, including Houses on the Achterzaan, Bateaux en Hollande pres de Zaandam and A windmill at Zaandam. The first European McDonald's restaurant opened in Zaandam in 1971. The Albert Heijn supermarket chain (founded in nearby Oostzaan in 1887), now grown into the Ahold Delhaize retail company, is headquartered in Zaandam. Chocolate manufacturer Verkade also hails from Zaandam. Football club AZ (Alkmaar Zaanstreek) was founded in Zaandam on May 10, 1967. ^ a b Municipality of Zaanstad, Zaanstad in cijfers . As of 1 January 2017. ^ Koppenrade, Liza. "11 dingen die je nog niet wist over Tsaar Peter de Grote". Oneindig Noord-Holland (in Dutch). Retrieved 8 September 2018. ^ "Czaar Peterroute". Wandelrouteboek Nederland (in Dutch). ANWB Media. 2005. p. 54. ^ "Czaar Peter Monument in Zaandam" (in Dutch). Rijksdienst voor het Cultureel Erfgoed. Retrieved 6 September 2018. ^ McDonald's International (Press Release), "Fascinating McFacts about McDonald's International", 1996. Wikivoyage has a travel guide for Zaandam.